Alum-A-Uke: is hand-crafted in the USA and designed for superior sound, durability, playability, and appearance. 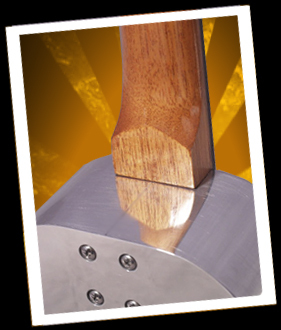 Alum-A-Uke is constructed of 6061 hardened aircraft grade aluminum, hand polished to a gloss finish. Three years of research and development have resulted in a brace-less construction method for the best response and tone possible. This ukulele features excellent tone quality and volume, easy playability, an adjustable saddle for fine tuning intonation, and bolt on neck to allow for adjustment or replacement. Tired of having a cheap travel uke? Alum-A-Uke durability allows you to take your good uke to the beach or a party without the worry of a delicate wooden instrument! Take your uke habbit out of the house and down to the party! Built to be the best and last ukulele you will ever need!